A new glass skywalk at the Yanoda Rainforest Cultural Tourism Zone in Baoting county, Hainan, opened to the public on Feb 2 to upgrade local tourism products and offer brand-new tourism experience. 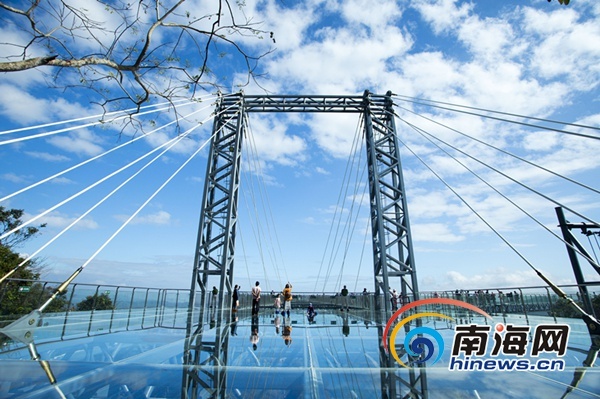 It has a total length of 365 meters including a 108-meter cable-stayed glass cradle head and a 257-meter gallery road located at a cliff in an altitude of 400 meters belonging to Wuzhishan Mountain. The Yanoda Rainforest Cultural Tourism Zone, about 35 kilometers away from downtown Sanya, is a representative of Hainan's five tropical rainforests, which can be regarded as China's diamond-grade rainforest scenic spot. The name "Yanoda" means "one, two, three" in the local dialect, it also means "hello", expressing amicability and blessing.